Fleet Foxes were becoming increasingly popular and by late 2007 they had attracted over a quarter of a million song plays over two months on their Myspace site. Although the band had not released any of their recordings, they benefited from word of mouth exposure and their success soon translated into a record deal, signing with Warner Music subsidiary record label Sub Pop on January 18, 2008. According to Sub Pop A&R Sue Busch, at the time of signing the band were still a relatively primitive set-up, being without manager or legal representation. Robin's sister Aja Pecknold henceforth assumed the role of band manager. The band's frontman, Robin Pecknold attributes much of their success and popularity to illegal file sharing. The band completed the recording of their second EP, Sun Giant, around the same time in preparation for upcoming tours. Fleet Foxes began their spring tour with fellowNorthwest band Blitzen Trapper on February 28, 2008. The band's performances, first at the SXSW festival in March 2008, and then the Sasquatch! festival in May 2008, moved the band into the public consciousness, notably attracting attention from the European press for the first time. Sun Giant was released internationally on April 8, 2008 and the group's brand of folk, rock and pop, marked by their use of vocal harmonies, was well received by the press. Despite the warm critical reception, the group stated that the EP did not represent their full ambitions, serving merely as a CD to sell while on tour. In May 2008 the band chose to extend their North American and European tour until September in support of their forthcoming album. Additionally, the band grew in number as songwriters Christian Wargo andJ. Tillman joined Fleet Foxes on guitars and drums respectively. Their debut full length album Fleet Foxes was released shortly afterwards on June 3, 2008. The album achieved similar critical success as the previous EP had. 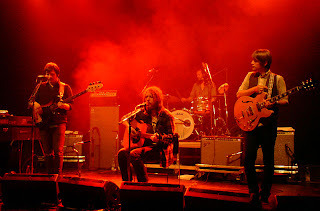 Fleet Foxes received four out of five stars from Rolling Stone, who compared it to the likes of the Beach Boys, Animal Collective, and Crosby, Stills & Nash, and a 9.0 out of 10 in a review by Pitchfork Media, as well as sharing the website's album of the year rank with the Sun Giant EP. The Guardian was particularly complimentary, awarding the album five stars and declaring it "a landmark in American music, an instant classic." On June 24, 2008, Fleet Foxes went to #1 on the CMJ Radio 200 Chart. The album achieved an average rating of 87/100 from 30 critic reviews on aggregator website Metacritic. While the group enjoyed moderate success in the United States, Fleet Foxes was better received in Europe, selling over 200,000 copies in the first five months following its release. The sales were matched with critical plaudits and their debut album won Uncut's first ever Music Award 2008 prize. Uncut editor Allan Jones said that the album "showed impeccable musicianship, and though you could trace its antecedents, it sounded totally unique. Fleet Foxes was just a glorious debut." The band sold out music venues for their tours of Australia, New Zealand and the United Kingdom, reaffirming their growing popularity. At the end of 2008, Fleet Foxes was rated album of the year by Billboard's Critic's Choice and in Metacritic's end of year best album round-up it appeared in 17 lists, topping six of them. Furthermore, it had sold over 210,000 copies in North America and over 100,000 copies in the United Kingdom, making it the first gold certificate record for UK labelBella Union. Their growing profile enabled the band to make televised appearances, playing on Vincent Moon's "La Blogotheque" in December 2008 and on Saturday Night Livethe following January. In 2009, they toured in Europe to favorable reviews; Dutch newspaper De Volkskrant said their show in Paradiso induced goosebumps. Throughout 2008-9 the band played globally ending the tour in September with a final European leg. Fleet Foxes played at the Bridge School Benefit curated by Neil Young on October 24 and 25, 2009 at the Shoreline Amphitheatre in Mountain View, California. This is the second time they supported Young after a summer bill in Hyde Park, London. This summer, Fleet Foxes will make a welcome return to to the music festival Way Out West. The event will take place on August 11-13th in Gothenburg, 2011. The group’s first performed at Way Out West in 2008. Fleet Foxes performing at Hard Rock Calling2009.